Buy Mi Band 2 Online in India from Banggood at 800 Rs Only: Tired of waiting for My band 2’s to come in stock..? Well, we found the perfect alternative to buy these products. Now you can buy Mi band 2 at 800 Rs only where the actual Mi band 2 cost starts at 2499 Rs in India. 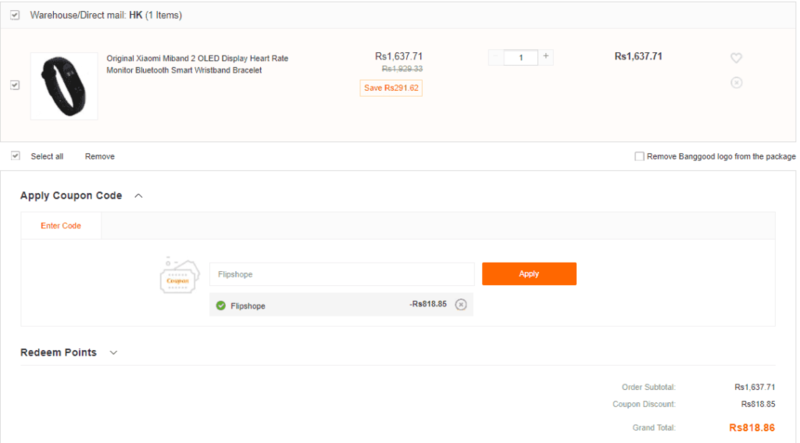 To Buy Mi Band 2 you need to visit one foreign site named Banggood.com this site is presently offering Flat 50% coupon for Flipshope visitors. Simply use Flipshope coupon code at the checkout of Mi band 2 and get Flat 50% off. This product even comes with free shipping, so here are the complete details of Buy Mi Band 2 Online Banggood for 800 Rs. Mi band’s have become so much popular right after their launch in India but now they aren’t available to buy in India. To buy Mi band 2 you need to wait for them to be back in stock but from now on you can easily buy them from Banggood and use our coupon code (Flipshope) at the check out to get Flat 50% off. Here are the steps to buy Mi band 2 online banggood for 800 Rs. Mi band 2 isn’t available in India right now but as an alternative, you can choose gearbest. If not you can simply wait for the products to be back in stock. So here we are providing Mi band 2 buying links of Flipkart and Amazon. The price of Mi band 2 starts at 1999 Rs and they might increase that to 2499 Rs. delivery charge depend on seller, so choose the seller who can offer free shipping. Just confirmed with banggood they were customs duties. As the product is coming from the foreign site they are charging 148 for shipping. Although shipping is free the cost included service tax and customs duties. We are very sorry for the inconvenience caused to you but you must pay the shipping charges now. The coupon is still not applicable. It is saying it’s invalid coupon.